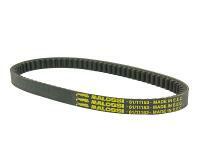 Malossi Aramid reinforced High Tech drive belt for added durability and optimal power transfer. Improved flexibility and less loss of power during transfer. 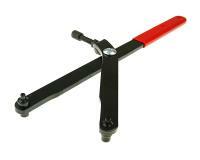 Stiffer counterpressure spring is required to avoid the melt slipping. Dimensions: 18,2x8x734 mm 30°. X-Kev Belt - The 5 layers from the X-Special version does advanced with one Kev line. Malossi includes polyamide fabric in the teath of the belts for the highest durability. Perfect belt for race use. Please check the application tab before ordering. Make sure your Kymco or SYM model is listed on applications.